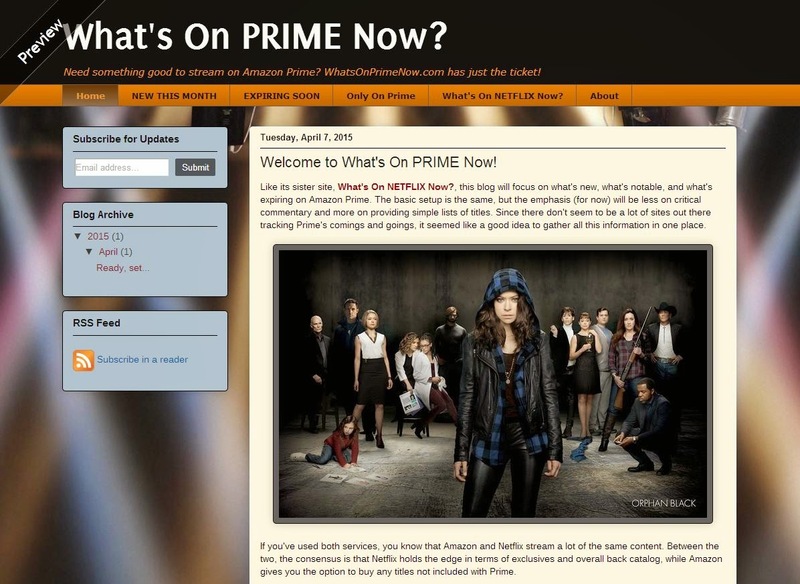 Introducing the new standalone blog for Amazon Prime subscribers: What's On PRIME Now? (catchy name, no?). Just like this site, WoPN will maintain running tallies of the service's streaming titles to help you decide what's worth watching. This replaces the single Prime page that debuted here last month, with a direct link now taking its place in the tab above—letting you essentially toggle between the two sites. Go ahead and take a look around. Even if you're not a Prime user, you may find it useful to compare the two service's offerings. I hope you like what you see! And feel free to let me know if I've forgotten something or if anything seems goofy. On an unrelated note: For some time, technical issues have prevented certain readers from commenting on this site, so I'm changing the commenting style to allow greater access. The trade-off is that now each new comment opens a pop-up window for you to write in, instead of letting you comment inline. It also, for some reason, removes the Reply option, which I'm not happy about but which we'll all just have to get used to—unless someone out there is more fluent in Blogger than I am, and can suggest a more elegant solution. It might be helpful if those replying to a previous comment put a "RE:" or a "In reply to ___" at the beginning of their comment, so readers can easily tie it back to the original. I actually prefer the new comment style because everything is in chronological order, and I can just read the most recent comments at the bottom of the page, rather than having to go back to make sure I don't miss any recent replies to older comments that might be helpful. Good point, Carol. Glad you're okay with the new format. I'm still getting used to it, myself. I do indeed really like their Captcha! I hated trying to figure the other ones out. I never have gotten any response from Blogger support, so I did some research on their forums and this seemed the best solution.